November has flown by, and the holiday season is now upon us. We are gearing up with festive decorations and looking forward to celebrations and the new year. The First Lady and I will host our annual Holiday Open House on Saturday, December 17 from 1pm to 4pm. The event is free, and no reservations are required. Click here or scroll down for more information. Hope to see you there! We have stayed very busy during the past month, from announcing over $46 million to support victims of crime, to celebrating the new D/E terminal connector at BWI. I even had the chance to meet students (pictured above) at Mount Harmony Elementary School in Owings! Read on below for some of the latest announcements from our administration, and stay tuned to future newsletters for a firsthand look at the progress we are making for Marylanders across the state. Standing at the base of the 75-year-old Governor Harry W. Nice Memorial Bridge, Governor Larry Hogan announced $765 million in funding for construction of a new Potomac River crossing from Charles County, Maryland, to King George County, Virginia. The Maryland Transportation Authority (MDTA) anticipates advertising a design-build contract for the new bridge in 2018, starting construction in 2020, and opening a new, wider, and safer bridge in 2023 – seven years sooner than the plan legislatively mandated during the 2016 session. Currently, there are 1,073 transportation projects, totaling nearly $8 billion dollars, under construction across the state – a record amount for the state of Maryland. 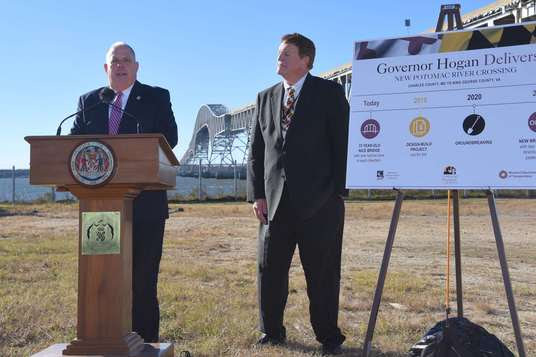 Governor Hogan, joined by Transportation Secretary Pete Rahn, announces $765 mlilion for a new Potomac River crossing. Governor Larry Hogan announced that over $46 million in Victims of Crime Act (VOCA) Victim Assistance federal grants will be awarded to state and local agencies and nonprofit organizations that provide assistance, services, and treatment for Maryland citizens who have been victims of crime. 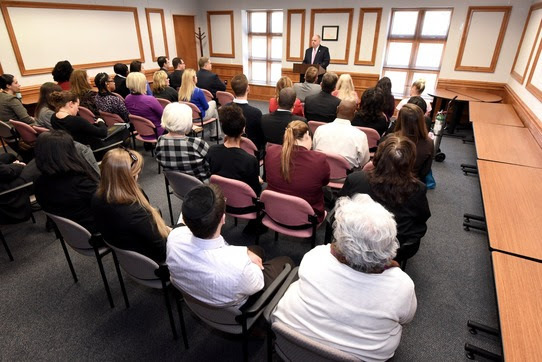 This year marks an increase in the allotment of VOCA funding to Maryland, and in response, the Governor’s Office of Crime Control & Prevention commissioned a Statewide Victim Services Needs Assessment to work as a guide for funding decisions, and to ensure that programs and services are fully responsive to the needs of crime victims across Maryland. 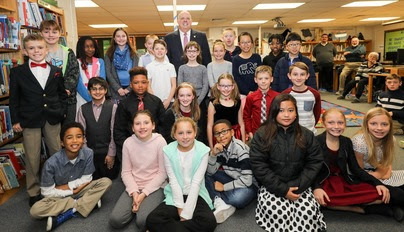 “Thanks to Governor Hogan’s strong commitment to supporting victims and the increase in grant dollars this year, every single eligible application was funded, including $35.9 million to continue and expand projects and $10.2 million for new projects or services,” said Glenn Fueston, executive director of the Governor’s Office of Crime Control & Prevention. Governor Hogan announces that all eligible applications submitted to the Victim Services Needs Assessment will be funded. The annual Across the Bay 10k, the fifth largest 10k in the United States, welcomed nearly 21,000 participants including Governor Hogan and First Lady Yumi Hogan. This year, Team #HoganStrong raised over $18,000 for cancer-related programs and research. 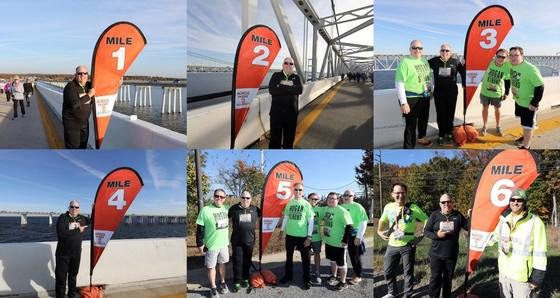 To see photos from the race, visit the Larry Hogan Facebook Page or click here. 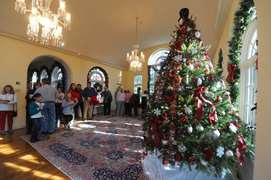 Governor Larry Hogan and First Lady Yumi Hogan invite Marylanders and their families to join them for a Holiday Open House on Saturday, December 17, from 1:00 PM to 4:00 PM at Government House. The event is free of charge, open to the public, and no reservations are required. Guests may park in the Bladen Street garage, which does not charge on weekends, or in other garages located on Main Street and West Street. Please click here for a detailed map showing more parking options in downtown Annapolis. The First Family asks that guests consider bringing unwrapped toys that will be donated to those in need during this holiday season. On behalf of Toys for Tots, the Marine Corps Reserve will be collecting donations under a tent by the front gate. Morgan Stanley & Co. LLC, a leading global financial services firm, is expanding its operations in Baltimore City and plans to create as many as 800 additional jobs over the next four years. The company currently has approximately 1,000 employees at offices on Thames Street at Harbor Point, and plans to create the new jobs at that location and a new location at 100 South Charles Street. With more than 250,000 square feet of space between the two locations, Morgan Stanley’s Baltimore offices will contain a wide variety of roles across multiple divisions. Maryland Governor Larry Hogan and First Lady Yumi Hogan joined business and state transportation leaders at Baltimore/Washington International Thurgood Marshall Airport to celebrate the opening of the $125 million D/E Connector, a major airport construction project that will improve customer service for BWI Marshall Airport travelers. The D/E Connector provides additional international airline capacity and new passenger services, including a new security checkpoint to serve domestic and international passengers. The D/E Connector project also includes a gallery featuring art created by regional artists. A five-member jury panel of local educators selected the art during a recent competition. 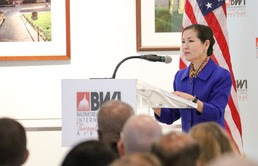 Maryland First Lady Yumi Hogan served as chairperson of the panel and was at the airport to acknowledge the winners. A total of 581 entries were received during the contest, and 28 pieces were selected for the exhibition space. 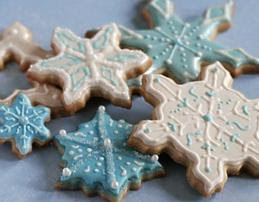 During the holiday season, Government House bakes approximately 15,000 cookies in preparation for open houses and guests!